The portrayal of gender in science fiction is a fascinating and sometimes overwhelming topic of discussion. As science-fiction is often referential and sensitive to the time period it was written and portrayed in, it is far from being just fantasy and yet is still encapsulated in the imaginative. It is a metaphorical space, a world apart, yet still our own world apart, where new biologies and technologies inspire us while traditional structures of society, gender and power reveal us. With this in mind I am conducting a visual and cinematic survey of the Forrest J. Ackerman collection at the American Heritage Center. As Ackerman was such an avid fan everything sci-fi there is a breadth of material to work with in his collection. My goal is to use production stills, promotional materials, and movie posters to discuss gendered themes that are concurrent with the mood of and timbre of the American post-war and Cold War era in which gender became a crucial ground of conflict and statement with a cultural and political push to solidify the domestic and feminine in order to establish security and order. These themes are overly apparent in various artifacts in the Forrest J. Ackerman collection. While the collection is overwhelmingly fun to go through (partly because it includes the recently named tribble, “Furry Ackerman”), it is also revealing in its scope and diversity. A good example of the gendered ideals of the American postwar and Cold War eras comes in the form of the movie poster. Seemingly, it is impossible to promote a science-fiction or horror film in the 1950s or 1960s without illustrating a damsel in distress, often scantily clad, in the arms of the villain or monster of the movie. 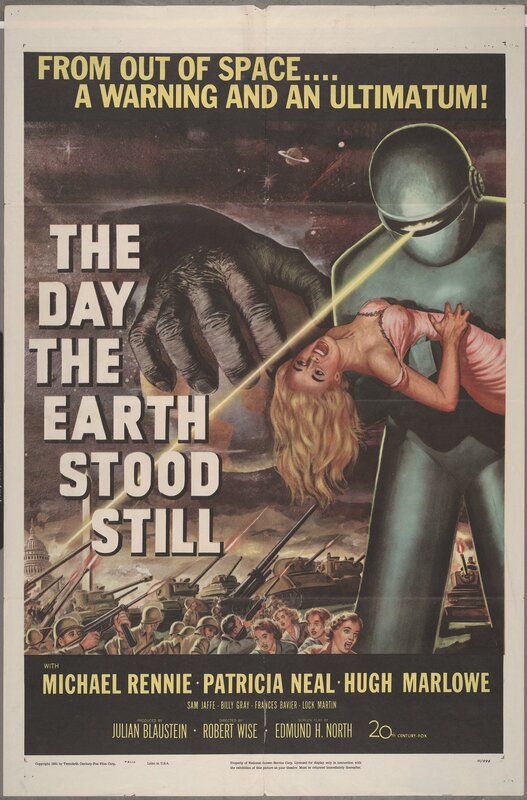 One great example is the movie poster to The Day the Earth Stood Still, in which the powerful alien robot Gort is holding the terrified and seemingly hopeless woman who doesn’t appear in the film whatsoever. Film Poster from the 1951 movie. Forrest J. Ackerman Collection, oversize folder 116, Collection No. 2358, American Heritage Center, University of Wyoming. The Day the Earth Stood Still is actually a fairly empowering movie in the terms of the women it represents. One of the main characters, Helen Benson, is a widow who is raising a son by herself. She is independent and turns down marriage to live her life in a way she finds suitable. Yet the movie poster still follows the cliché of damsel in distress that has no way of getting away from the beast (in this case Gort) without the aid of masculine intervention. Investigating into the paradoxes of the cultural mind of the postwar and Cold-War America opens a discussion of how gender construction affected policy and culture in America. The Forrest J. Ackerman collection is my portal to this investigation. This entry was posted in Interns' projects, popular culture. Bookmark the permalink. There is a great deal of misunderstanding about what that particular branch of literature called “Science Fiction” actually consists of. Is it space-ships and monsters? Time machines? Galactic empires? Well, it’s all of those things, and often none of them.Science Fiction, broadly speaking, is story-telling that deals with the impact of organized knowledge on human beings. Usually, this means technology, and the way it changes us.